This new product imported from New Zealand is taking advantage of the massive growth in the Chocolate Flavor segment with all or most of the vodka brands developing the concept. Imported by a company called Independent Distillers in San Ramon, California, Naughty Cow have developed a unique milk-processing technique that allows them to deliver a smooth real-cream product from Wisconsin that maximizes the chocolate flavor, which I believe is imported. Hopefully the country is Belgium. Throw in some vodka, and you have a fun drink that retails at $13.99, slightly less than the handful of competitors in the market. This particular segment of the market is dominated of course by Bailey’s, but many consumers perceive that as a seasonal drink. 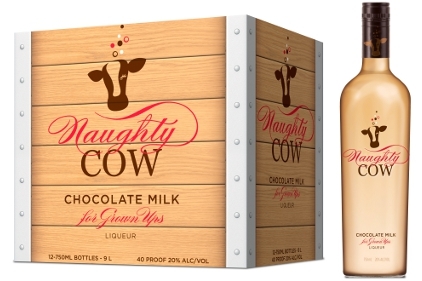 Launched in May this year, Naughty Cow has a good chance of capturing a solid market share for those of us who have always loved chocolate milk. The best way to drink this 40 proof drink is probably in a glass by itself with lots of ice. It comes across as a very smooth concoction, slowly providing a decent buzz, and one bottle should be enough for a couple of people per night if you are in the mood for something a little different outside of the holiday season. You will likely experience a taste of caramel and vanilla ice-cream. The web site is a little dull however and could do with some more information and maybe some more recipes, but as mixologists get introduced to the drink, hopefully that will happen. Place ice cream in Martini Glass. Mix vodka and Naughty Cow in shaker w/ice. Strain over ice cream. Pour ingredients into a glass filled w/ice. Top with whipped cream. For more information, please visit www.naughty-cow.com and www.independantdistillers.com.